Is Chris Christie the one we have been waiting for? You know the chosen one like Obama was in 2008 when the world essentially genuflected before him. Democrats are running scared that the New Jersey governor is indeed the dark horse who can get to the wire ahead of Obama in 2012. The idea of a governor only in power one year becoming president might have seemed fanciful in other times. But these are no ordinary times and Christie has the Democrats distinctly nervous. At a farewell reception and dinner for Senator Chris Dodd at the Irish Embassy this week I heard his name over and over. Among the Democratic bigs present were Vice President Joe Biden and Senator Patrick Leahy, Vicki Kennedy and Teddy's sister, Jean Kennedy Smith, as well as congressmen and Maryland governor Martin O'Malley. I found the mood surprisingly upbeat given the grim results of the midterms. Perhaps it was the caliber of the Republican field for 2012 that was giving them some relief. Clearly they would relish a face off against Sarah Palin or Mike Huckabee. Mitt Romney is taken more seriously, but right now Christie is the name that resonates. Democrats know they lost the blue collar Catholic ethnic vote in a line stretching from Upstate New York across to Pennsylvania, Ohio, Indiana and the Mid West. As an Italian/Irish Catholic Christie speaks directly to that constituency. The next election gets fought over similar terrain.Christie's appeal like Joe Biden's is to that very same ethnic coalition. If you think Biden was brought onto the ticket for his foreign policy experience and not his deep Scranton Irish roots appeal I have a bridge to sell you. Christie is also moderate enough that they know he will not be easily consigned to the Tea Party tea chest when the going gets rough if he decided to run. But most of all he is seen as plain spoken, articulate and prepared to take on special interests. He's now the candidate in the way Obama was for Democrats last time, unencumbered by baggage, liked at all levels of the party so far, but still somewhat of a mystery. It is an amazing reality that just over a year in office and still a novice, he is the candidate who sets the alarm bells ringing in top Democratic Party circles. That speaks to either Republican weakness at the top of the ticket, or the new reality in this ADD age that a fresh face come election time trumps the same old visage every time. 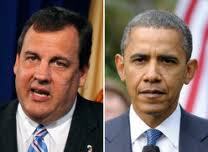 How Obama would shape up against a popular East Coast governor would make for a fascinating battle and not one the White House could have forseen when Christie was first elected. Of course he keeps saying he won't run but Obama, a first time senator,was making the same kind of noises four years ago.